Long ago, when the moon ruled and the forest only consisted of trees, a chanterelle began to appear from the ground. It was difficult for the chanterelle to survive and she fought for several days until finally she appealed to the moon: "Please moon, if you let the trees help me to grow, then maybe I can help the trees to grow in return." The moon questioned how this would ever happen, afterall, chanterelle had nothing to offer did she? 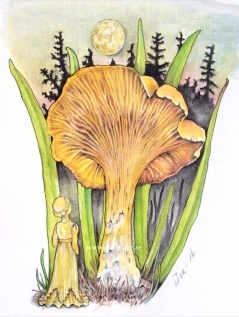 Chanterelle knew that the moon would never change its mind, so therefore, chanterelle continued to struggle on her own. Suddenly, difficult times arrived. The trees began to droop and it became much colder. One day,one of the moon's rays beamed down onto the chanterelle. It said: "I have learnt that there are many things that you can never take back, like a spoken word and a missed opportunity, but please chanterelle, do not listen to the moon, it only sees things from one side! - Can you please help us "? The chanterelle replied: "You have the right wisdom moon beam, but don't ever forget to take advantage of all the new opportunities that emerge." Since that day, chanterelles and trees grow alongside one another and give each other the strength they need. We must take advantage of the knowledge and skills that many newcomers have. In contrast to many other fungi, chantarelle live in symbiosis with the trees. And did you know that we only see one side of the moon?